My 2016 Subaru WRX Premium and I just celebrated our three-year anniversary. Yes, we have an anniversary. And yes – it’s worth celebrating! Three summers ago, I traded in my white Subaru Impreza hand-me-down, affectionately known by the family as “Blob” for its floaty suspension, mushy clutch, and uncanny resemblance to the Zoloft anti-depression pill mascot, at around 100,000 miles for a set of sportier wheels. The new love – and turbo – was swift, and the bond quick (sorry, Blob). Like two long-lost brothers, “T-Rex” and I took to each other immediately. In less than a year, we had loaded up and moved cross-country from Pennsylvania to a town in Idaho we’d never seen before – save on Google Earth – traversed 18 states, been let off of six police pull-overs with nary so much as a warning ticket (Forbes notes this breed of car is constantly on the list of “most ticketed” in America and took the top spot in 2014, the year before I acquired mine), then passed the 30,000-mile check-up with flying colors. “In an unannounced, private meeting, the Teton County Board of Commissioners decided to implement a $250 fee for anyone who owns any kind of Subaru branded vehicle in Teton County,” the Teton Valley News jokingly reported. “A $500 dollar charge will be issued for every additional Subaru registered in the same household. The decision came after a recommendation from the newly formed road committee. This particular part of the country represents, in my mind, a microcosm of what Subaru stands for: that is, a little bit of everything. The western side of the Teton Mountain Range, known as “the quiet side” (compared to the bustling 10,000-person metropolis of Jackson, Wyoming), is populated by old Mormon clans who settled the valley to farm and ranch and still do, middle-aged yuppie couples who are still ski bums at heart, but were forced to get something more than a seasonal job when they started having kids, and single folk, young and old, who have dogs instead of children and who spend their time making minimum wage and shirking suburban responsibilities to play in the great out-of-doors. Subaru accommodates the diversity of motorists who flock to this beautiful valley for various reasons by providing all-wheel drive autos to suit every type. The ultra-practical brand of car finds a loving home amongst the people most prone to do the most impractical things. And a kooky little shop called “Sue’s Roos” caters to them all and is where good Subies go to die. There’s the reliable and rugged Outbacks and Foresters sensible families and gear-happy hippies prefer. The latter putter around town, parking their worn wagons dotted with bumper stickers denoting decades-old, faded notions of “Hope” and dubious astrological configurations promoting “Tolerance” outside the natural grocer, where they buy what seems by smell and texture to be bird feed compatible with human digestion. The Crosstrek, an athletic-looking hatchback, is a relatively new addition to the Subaru lineup and appears to appeal to men who want to shake the stigma of the “Lesbaru” (Subaru deliberately marketed to lesbians in the 1990s and hasn’t completely escaped the stereotype), yet seek an affordable, sturdy ride that looks more macho. Crosstreks aren’t very prominent in Teton Valley, though, where the dry air and relatively low-wages of drivers tend to keep in circulation recycled and well-loved cars with loaded odometers. Take, for example, the Subaru Brat relic with its twin, Mad Max-esque smoke stacks that’s not in circulation, per say, but which serves as a sort of standard in someone’s front yard, letting visitors know this is a place for unapologetic absurdity and bodacious badassery. There are a handful of Legacies and Imprezas to be seen, but the real standouts are the “rally cars”: the turbo-charged WRXs and STIs, the vintage models of which are often cherished as much, if not more than the brand-new ones. Why are Subarus a smart choice? On a more serious note, Higgins recommended a set of high-quality snow tires. My She-baru and I endured a challenging and precipitous first winter in Idaho, but despite our low-ground clearance, a combo of all-wheel drive and the best Blizzak tires Daddy could buy me as an early Christmas present had us winding up and down the Grand Targhee ski “hill” and over Teton Pass in “Wydaho” (Wyoming/Idaho) at elevations surpassing 8,000 feet without incident – or fear! 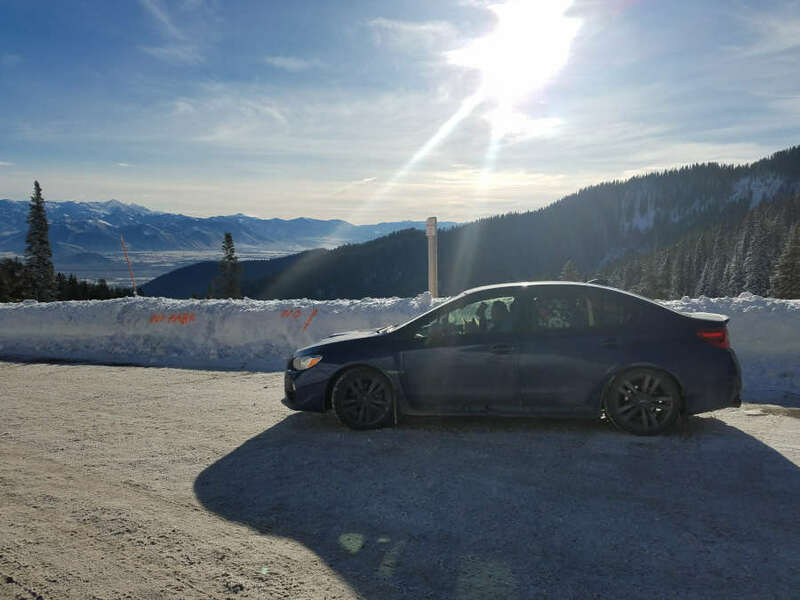 My WRX and I am have been through a lot together, mostly in Idaho: a couple breakups, a handful of weddings. Several cross-country sojourns and multiple moves that had her stuffed to capacity with boxes and bins and empty coffee cups. The car’s interior has held up to the energetic expenditures and muddy paws of a terrier puppy (Subaru is also super pro-dog! ), whose wiry coat makes him seem almost as impervious to the elements as the WRX. Together we’ve endured white-outs, heatwaves, and miles and miles of the Midwest. We hit a deer, had a window smashed, and nearly ruined the engine during the Great Oil Change Disaster of 2016. We’ve also been the envy of teenage boys who admire the WRX’s muscular stance and throaty rumbling of the modified muffler, and who have challenged us to race. We’ve made unlikely friends with a mechanic who wears large gauge earrings and has neck tattoos, and we’ve enjoyed, while trying to play it cool, the thrill of the two-finger steering wheel salute the sporty Subaru drivers give one another when they spot an oncoming hood scoop. Subarus, like the people of Teton Valley, exude a unique sense of assuredness that comes with being safe and competent in the face of Mother Nature’s most turbulent moods and terrains. (While covering a leg of the Eukanuba dog sled race, we watched with smug satisfaction as a Subaru pulled a Nissan “Off-Road” truck out of a snow drift.) Such confidence appeals to all sorts (my 88-year-old grandma drives a Forester), and nowhere that I’ve found is this truth more apparent than in the eclectic yet uncommonly communal land of Teton Valley, Idaho.